Latest post Sat, Oct 20 2018 5:32 PM by Terry Snyder. 7 replies. "Exception: Failed to get sample position from the AMA plug-in"
When I originally created the sequence, I consolidated the shots to DNxHD and deleted the AMA version of the clips. I can Match Frame to the shots and they are there--I can play them and cut them in to a new sequence. I have checked every bin in the project and there no AMA linked clips. I 'd check that the original files on the disk are Ok and NOT corrupt. Play using a third party player such as VLC. If the media file itself is corrupt you'll need to restore it from a backup. If it checks out, try copying the file to a new drive, hiding the original from Avid and re-linking it. Note that sometimes links separate media files in to a single file (XDCAM for example will string multiple 2G files together) that can also cause this. If that isnt it then I suggest you contact support and have a tech check your computer and MC out. The weird thing is the clips play fine in the bin and I can cut them into a new sequence. When I click the monitor on the top track (a video mixdown) I can play the sequence, but selecting the monitor for any other video tracks (even tracks not containing clips such as titles, etc.) gives the error and the sequence won't play. I checked all the bins in this project and don't have any AMA linked clips. Is there a way to force a "break" to any AMA link that is hiding somewhere and interfering with the playback? I would try to view the colors of the clip in the timeline and tick the AMA. Next, I would try to cut the sequence into a new sequence (not duplication, create a new sequence and then cut off the original sequence). Not sure what you mean? Open up color correction? I did that and I still get the error. 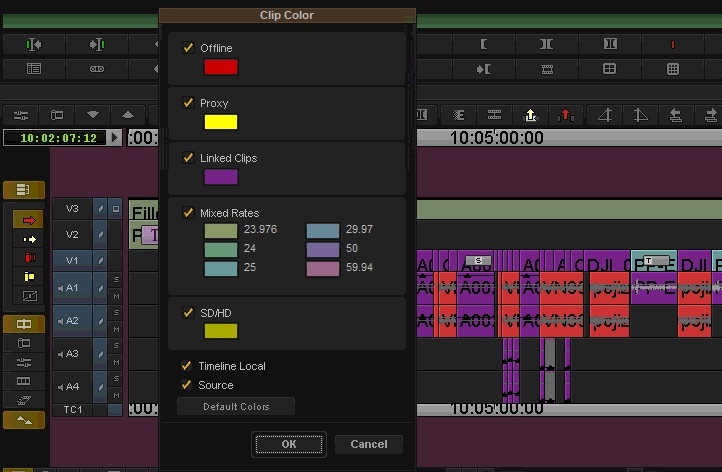 Quick menu at the bottom left of the timeline, "Clip color", see the attached picture. I would also try to consolidate the sequence with the "Consolidate only linked media"
Thanks. I was able to find the clips that were AMA linked to footage no longer available. After deleting these from the timeline, I was able to play the sequence. On future versions of MC, it would be great if MC would still play the sequence but simply display a black screen with the words "AMA clip off line" (or something to that effect) the same way it gives a "Media Offline" message but still keeps playing. As it stands now, if there is a single broken AMA link in a sequence, MC won't play the sequence at all and displays the "Failed to get sample position from the AMA plugin" error.